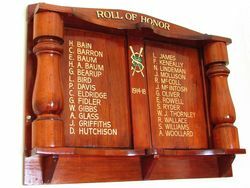 Honour Roll is a carved and polished wooden board which lists those from the Sale Rowing Club who served in World War One. The Sale Rowing Club's season was declared open by the president (Cr. Cullinan) on Saturday last, in the presence of a large muster of club members and friends. 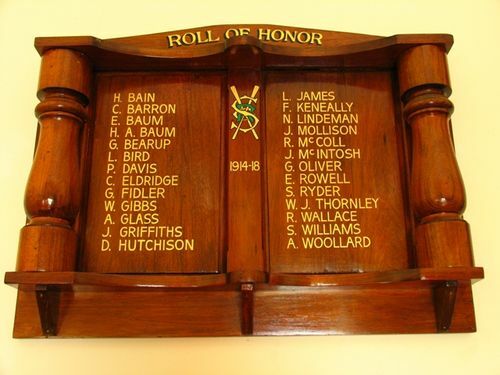 On the club's honour board, which was unveiled by the Mayor (Cr. Brennan) were the following names:-H. A. Baum, L. Bird, H. Bain, G. Bearup, C. Barron, P. Davis, C. Eldridge, G. Fidler, L. James, F. Kenneally, R. McColl, J. McIntosh, G. Oliver, E. Rowell, S. Ryder, W. Gibbs, D. Hutchison, R. Wallace, A. Woollard, S. Williams, E. Baum, N. Linderman, W. J.Thornley, J. Grifliths, A. Glass, and J. Mollison. Gippsland Times (Vic), 13 November 1919.